Lubric 0.5% is the preparation of Hydroxypropyl Methyl Cellulose. It is a clear and colorless aqueous solution. 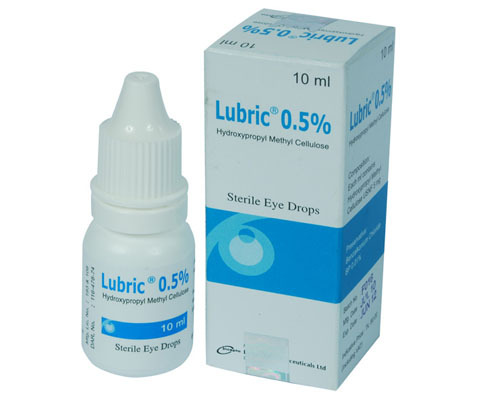 Lubric 0.5% lubricates the surface of the eye in the same way as natural tears. It can therefore be used to relieve the dryness and pain associated with reduced or abnormal tear production. The dose of Lubric 0.5% will be different for different patients. Follow your doctor\\\'s orders or the directions on the label. Adults and children-Use 1 drop three or four times a day. Children: This drug does not cause different side effects or problems in children than it does in adults. If you experience eye pain, changes in vision, continued redness or irritation of the eye or if your symptoms continue for more than 3 days or become worse, check with your doctor . Hydroxypropyl Methyl Cellulose has not been shown to cause birth defects or other problems in humans. Hydroxypropyl Methyl cellulose has not been reported to cause problems in nursing babies.